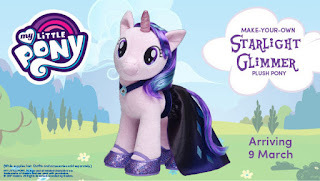 Early December 2016 a concept of a Build-a-Bear Starlight Glimmer was spotted, but after that it's been pretty quiet around anything Build-a-Bear. 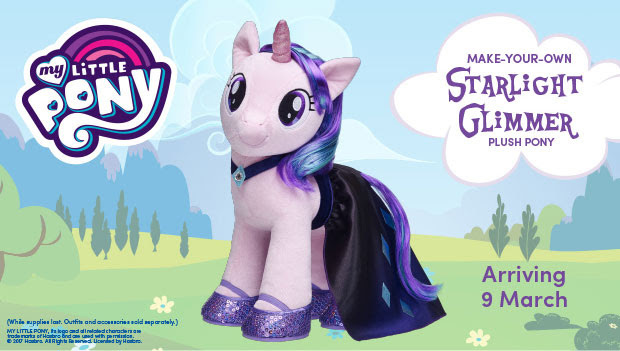 Up until this week that is, as the Australian branch of BaB sent out a promotional mail to their subscribers about the official release of the Starlight Glimmer plush on the 9th of March. While this day is only valid of Australian stores, it is very common that BaB releases new figures in multiple countries around the same day/week. So there is some hope that the US, UK and other countries will not have to wait much longer than that! Thanks to Michael for the info! I just realized, the dress she's wearing is the dress Rarity had her try on during the S5 finale song!